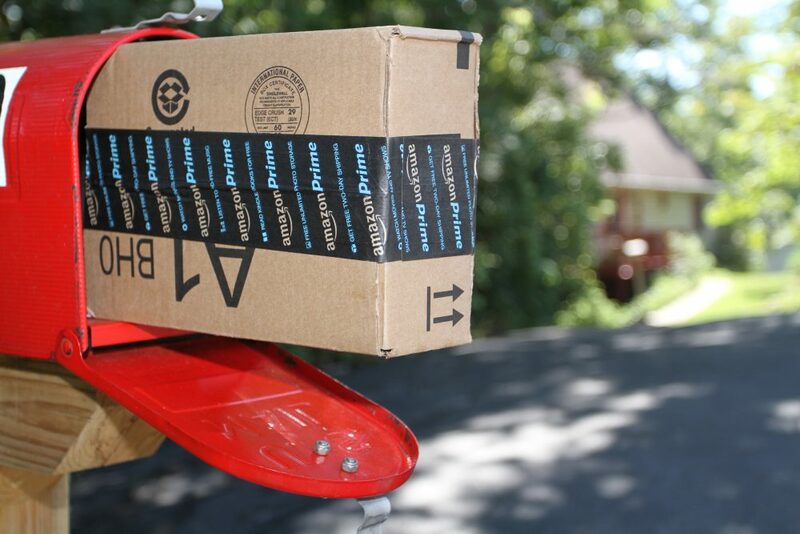 A box containing an order from Amazon.com is shown after it was delivered to a house in Etters, Pa, Sept. 16, 2005. The rapid growth of digitization and e-commerce is rendering many long-time trade practices and policies obsolete. Photo by John Zeedick/Associated Press. Consider two distinct worlds only a few miles from each other. One world is that of Jennifer and Nicole, recently featured in The New York Times, who have worked all their lives at the Carrier air conditioner factory in Indianapolis and eagerly expect President Trump to impose tariffs on air conditioners to prevent their factory from moving to Mexico. The other world is that of Travis, who lives 150 miles away in Elkhart, Indiana, and started his online business at $3,500 and today sells motorbike gear to 131 countries and derives 41 percent of his revenue from exports riding on free trade. Which is the world you want to live in? One where low-skilled, disillusioned factory workers call for protectionist barriers? Or one where entrepreneurs—using their ingenuity, state of the art technology, and the open market access that American trade negotiators have secured over the past eight decades—sell to customers across the planet, and grow their businesses, hire new people, and realize their full potential? If you choose the latter world, that’s great. But we will need a new roadmap to navigate it. The image of globalization, imprinted on many minds, is of American factories fleeing to Mexico or China. But here’s what globalization really is: the voluntary, mutually consenting exchange of goods and services between a buyer in one country and a seller in another country. More important, here is what globalization is becoming: cross-border sales of goods and services among small businesses—like Travis’s motorbike gear venture—that are selling online, and foreign buyers who are finding them there. Why would we want to shut down such globalization? E-commerce is breaking what seemed to be an “iron law” of international economics: that exporting was possible only for large companies. Today, while fewer than 5 percent of U.S. companies export, 97 percent of U.S. eBay sellers do. In a new survey of more than 3,000 developing country companies, my firm Nextrade Group finds that half of small online sellers export (while only 20 percent of small offline sellers do), and that more than 60 percent of online sellers export to two or more markets (as opposed to offline sellers, who tend to export to only one market). Workers manufacture car dash mats at a maquiladora belonging to the TECMA group in Ciudad Juarez, Mexico, Dec. 27, 2013. Photo by Ivan Pierre Aguirre/Associated Press. Companies today are born global because they are born digital. Which makes this a historic time. We are at the verge of creating a global equivalent of a medieval town square where small sellers and buyers come together to transact. It is a market where anyone can sell to anyone, anywhere, anytime. While e-commerce enables developing countries to leapfrog to the 21st century’s technology-powered world economy, countries like the United States are particularly well-placed to benefit. We already have the connectivity, logistics, online services from payments to finance to cutting-edge online services, intellectual property, and people with wide-spread digital skills, which developing economies lack. But we are not optimizing this opportunity. If we were, we would be celebrating free trade and open markets as enablers of our small businesses and online entrepreneurs, not bashing them as enemies of our factory workers whose time has passed. McKinsey Global Institute—which uses dozens of indicators to create an index of digital assets, usages, and workers—finds that the United States is using only 18 percent of its full digital potential; Europe is at just 12 percent. In a survey I recently conducted, U.S. middle market companies graded themselves C- on digital readiness. And more than 50 percent of developing country small businesses rate as poor or very poor in a number of areas in their economies needed for e-commerce to work, such as digital regulations, e-commerce logistics, access to online finance, and their own capacity for cross-border e-commerce. •	Microloans for micro businesses. Export credit agencies have traditionally provided trade credit insurance and guaranteed exporters’ working capital loans issued by banks. E-commerce presents a new challenge: Micro and small online sellers often need much smaller and faster working capital loans than banks are able to issue. At the same time, FinTech and online lending companies are on a tear, literally making up for lack of bank lending for small business. Online lenders offer a huge opportunity for export credit agencies like Export-Import Bank to guarantee diversified portfolios of microloans for export-driven online sellers, thus lowering their cost of capital. •	Export promotion for online sellers. Getting online is one thing; successfully exporting online is another matter. Cross-border e-commerce requires keen know-how about export promotion that smaller countries and even government agencies (like the export-promoting Commerce Department) don’t have—such as how to create an international multi-channel shopper strategy or build savvy online advertisement strategies for different markets. So who knows how to promote e-commerce exports? Global e-commerce platforms do, and they have a keen interest in cultivating new e-commerce users. One innovative model for e-commerce capacity-building is a social impact bond, whereby private foundations, social impact investors, and commerce platforms make the initial investment in promoting exports and get compensated at a premium by the government and development agencies if the project meets certain pre-established metrics that governments value, such as the number of e-commerce-related jobs created, or the amount of new exports. Social impact bonds have been used to cure malaria and save rhinos. So why not to promote e-commerce? Companies today are born global because they are born digital. Which makes this a historic time. We are at the verge of creating a global equivalent of a medieval town square … It is a market where anyone can sell to anyone, anywhere, anytime. •	Customs procedures for small business. Customs regimes in many countries are still tailored to the needs of traditional traders and large companies, rather than to small businesses with limited compliance capabilities. Study after study show that complex customs requirements are a top concern for small exporters and importers in the U.S. and worldwide. The silver bullet for getting rid of these barriers and fueling small business trade is raising de minimis levels—the value of shipment below which goods enter duty- and tax-free. High de minimis creates free trade for small business. In a major service to small foreign businesses selling to U.S. consumers, and to U.S. consumers and companies buying from abroad, the United States raised its de minimis to a very respectable $800 per shipment in 2016. However, de minimis is in many countries laughably low, such as $15 in Canada and $150 in the European Union). One solution is to launch negotiations on de minimis among a “coalition of the willing.” In such an agreement, each member government might commit to ratcheting up the de minimis level over a period of five to seven years to, say, $1,000, in exchange for a similar commitment from the other members. In other words, each member government would give a little market access at the lower rungs of trade in order to gain a lot more market access in return, just as in a tariff reduction schedule in a trade agreement. •	Digital regulations. My new survey shows that even small online merchants often struggle with digital regulations when seeking to export. For example, in the United States, small financial services companies report suffering from stringent consumer data privacy and protection rules in foreign markets, and from uncertain legal liability for internet intermediaries for user content on their sites. In a survey of Latin American companies, I found that one-third of online sellers viewed uncertain legal liability rules as “very significant” obstacles, while one-quarter were negatively impacted by foreign data localization and data privacy rules. This is an area where the United States has gold standard rules, and needs to drive trading partners to adopt measures that are interoperable with ours. The Trans-Pacific Partnership was just that vehicle, and its killer, the Trump Administration, has to come up with a new and better one. A pilot could be run with the United Kingdom, whose officials have stressed digital trade as a path to competitiveness. •	Trade adjustment. The giant question mark in tomorrow’s economy is adaptability of labor—whether workers like Nicole and Jennifer could be retrained to take advantage of the seemingly limitless possibilities opened by the global online marketplace. The answer to this question is not at all clear. Existing tools—such as the Trade Adjustment Assistance that helped retrain more than 230,000 workers impacted by trade over the past decade—will not be enough. The policy question should rather be how to equip tomorrow’s workers to thrive in the global digital economy, one where the pace of change is very fast and competition is ubiquitous. One place to look is at Singapore’s model of active retraining of workers. Another solution: create public-private partnerships between the government and the resented “tech elite” companies such as Facebook to deploy corporate PR and social responsibility dollars to fuel the retooling and rehiring of digital-era workers, in exchange for lower payroll taxes. Globalization as we’ve known it is coming to a close. It’s time to stop chasing its ghosts—and to start crafting creative policies to empower workers and businesses so that they can leverage the 21st century tools for growth: e-commerce and open markets. Kati Suominen is founder and CEO of Nextrade Group, funder of TradeUp Capital Fund, Adjunct Fellow at the Center for Strategic and International Studies (CSIS), and Adjunct Professor at the UCLA Anderson School of Management. She is amid authoring her 10th book, on the future of globalization.